Ce accesorii stylish aruncam in bagaj vara aceasta? Ce ziceti de o pereche de saboti statement? Daca pana acum nu ati dat atentie acestui trend, e cazul sa aruncati o privire spre cele mai noi modele de saboti Gucci sau Fendi. Cu toc, fara toc, cu broderii sau aplicatii luxuriante, sabotii sunt un accesoriu ultra cool, un must have in bagajul oricarei fashioniste. 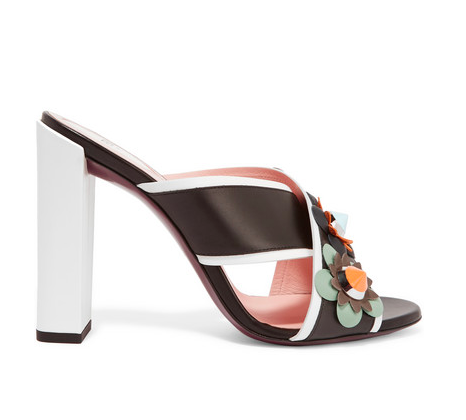 New bejewelled accents elevate Gucci's coveted mules for SS16. 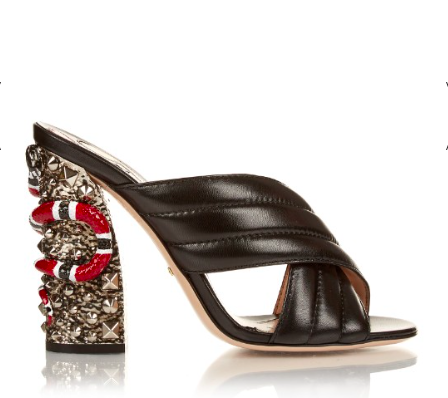 This black grained-leather Sylvia pair is shaped with signature thick crossover straps, and has a chunky silver-tone heel that's embellished with an opulent red snake and glistening studs. Show them off to best effect with dresses and cropped trousers.